No pile driving or heavy machinery. No damage to the yard, plants or landscaping. Tieback installation is done from the water. 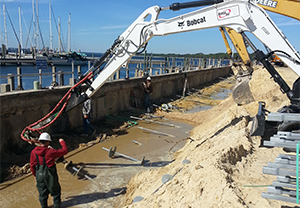 Many residential seawall repairs can be completed in a single day. Less expensive than repairs requiring excavation or reconstruction. It’s wise to repair a damaged seawall sooner rather than later because the damage is certain to become more severe over time. Heavy rains, high tides, and storms can quickly take seawall problems from bad to worse. In addition to posing a safety hazard, a damaged seawall detracts from property value and can make parts of a yard or dock unusable. What can be done to repair a damaged seawall? The range of repair options is the same for most types of seawalls, whether they are installed on residential, commercial or municipal property. Some contractors recommend replacing a weakened wall with new construction. Others prefer to excavate behind the wall and then perform repair and reinforcement work. Unfortunately, these strategies require heavy equipment and significant excavation. This disruptive work can take days and cost many thousands of dollars. 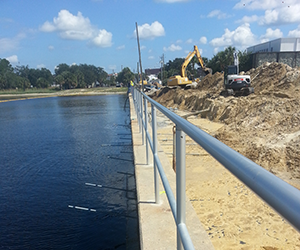 At Alpha Foundations, our technicians are trained to repair seawalls using helical tiebacks or wall anchors. This technique is gaining popularity because it’s faster, less disruptive and less expensive than demolition and excavation-based repairs. The great thing about tieback repairs to seawalls is that the repair work is done primarily from the water. To install each tieback, a hole is drilled through the seawall from the water side. Then a helical tieback anchor is inserted in each hole and “screwed” into the soil behind the seawall with a hydraulic drive head. Helical plates welded to the pier shaft make the tieback perform like a giant screw. Pressure readings tell the installer when the tieback is firmly anchored in the soil. Helical tiebacks are designed so that a threaded rod can extend from the shaft end through a pressure plate that bears against the seawall. By tightening a large nut on the threads, the seawall can be gradually pulled back into alignment and stabilized against further deflection. Future adjustments are also possible –just by tightening the nut. Installation of tieback anchors to repair damaged seawall. Completed seawall repair project using tieback anchors. The helical tieback technique is an engineered solution developed by foundation repair specialists. In addition to being used on seawalls, helical tiebacks are also used to repair and restore tilting or bowing foundation and retaining walls. 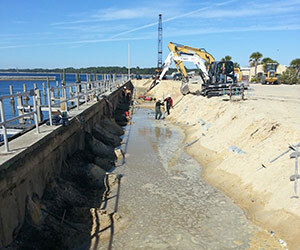 Whether your seawall is large or small, short or long, tieback repairs offer a fast, affordable alternative to seawall demolition and reconstruction. If you're interested in our expert seawall repairs, call or contact us today to schedule a Free Estimate. We also have proven solutions for residential and commercial foundation repair, as well as for the crawl space. Don't delay seawall repairs. Call today to schedule a free seawall repair inspection and estimate!